The first couple days with my host family, I had training during the day, so I was only home for breakfast and in the evening. In the mornings, my ma would fix my breakfast – one day it was scrambled eggs with onions on bread and another was spaghetti (in Liberia, spaghetti is a breakfast food!). Then my little brothers would show me the way to the training center (as they say here, they “carry me” there). They like to show me the “fastest ways” but all of their shortcuts and weaving in between houses and through yards instead of on the roads (not roads like we think of in the US, more like dirt paths and some larger dirt roads, that don’t have names), so it has been very hard for me to figure out my way around! Then my brothers would meet me after training to carry me home to another dinner at the table by myself. 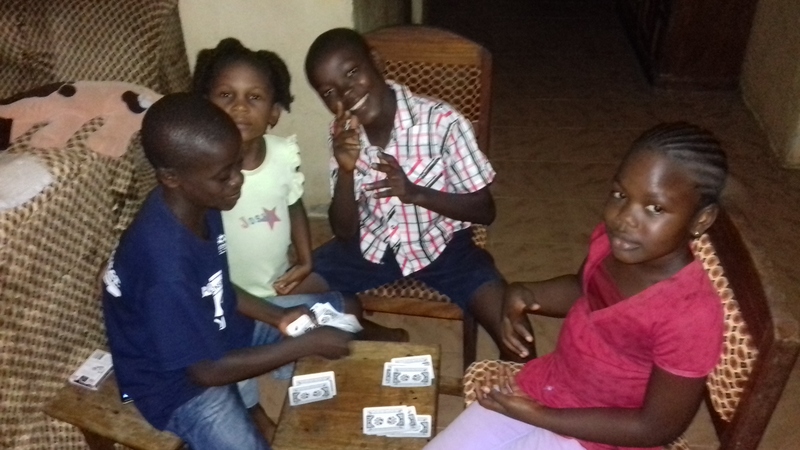 After dinner, one of the first nights, I taught my siblings and some of the neighbor kids how to play the Egyptian Rat Screw card game – now they ask me as soon as I get home if we can play the game! I’ve since taught them War as well, and they love to try to cheat if I’m not paying attention. At my host family’s house, we have current (what Liberians call electricity) that comes on in the evenings. At first it was only in the living room/dining room, but after a couple of nights, they set it up in my room too – that evening after it was already dark out, there were about 8 people in my room as I shined a flashlight so they could see to set it up. It’s only one bare lightbulb in the middle of the room (that works about 2 out of 3 nights), but it’s definitely nice to have! That next Saturday was the first day that I didn’t have training so I woke up early to start the day with my family. 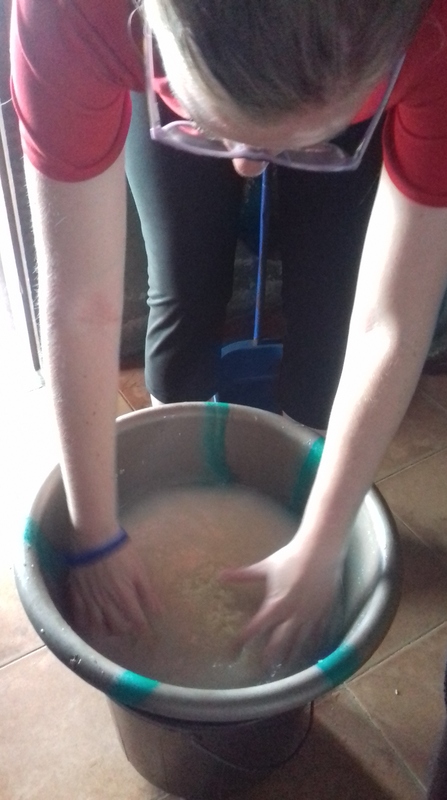 After breakfast, my host sister taught me how to wash my clothes – no washing machines, here we use buckets and a washboard. It took about an hour to wash a week’s worth of clothes, but that was with Blessing helping me (and definitely doing more than her share!). 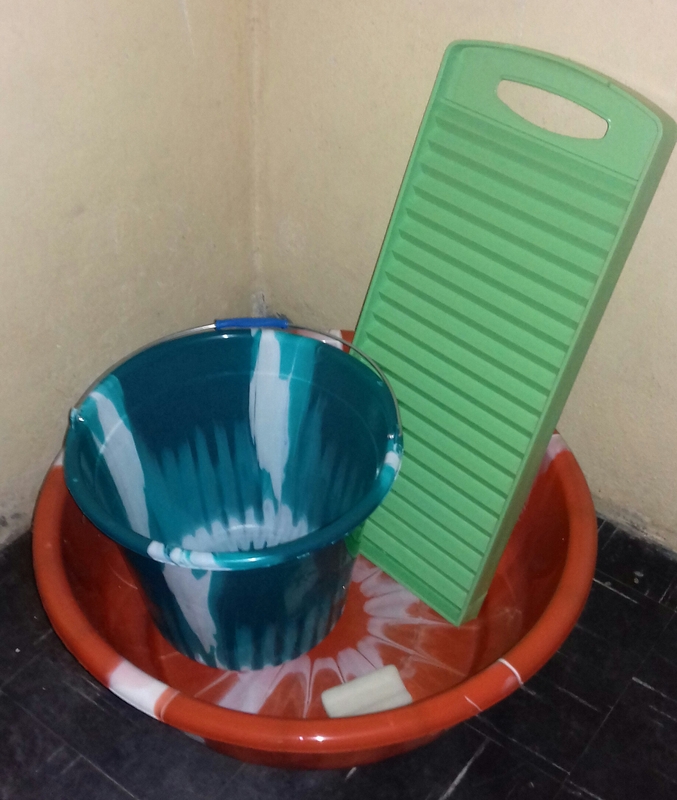 Liberian washing machine – washboard, tub and bucket! Next Blessing and I made dinner – my first cooking lesson! 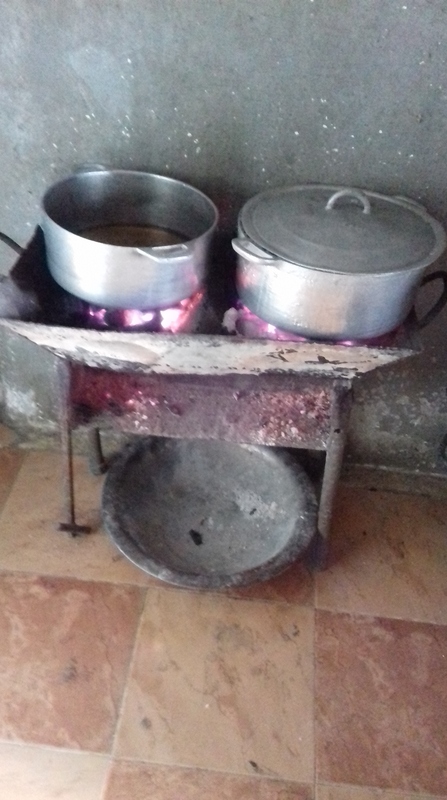 We made a currie soup (soups here are thicker, more like sauces) and rice on the coal pot. I had my first experience slicing an onion the Liberian way – they don’t use cutting boards, instead they hold the onion and slice it in their hands. The first time she handed it to me to try, I almost nicked my finger! I also had my first experience cooking on the coal pot! 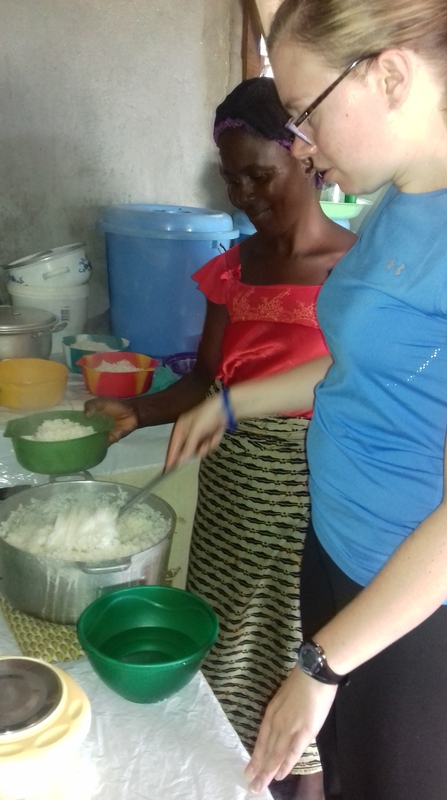 After we finished cooking, I went to meet up with a few Peace Corps friends. One of our projects during PST is to have a boys or girls club with kids in our neighborhood – hoping to write more about our boys club in a later post! Then I came home and had some time to rest in my room and figure out how to call home to America! Here in Liberia, it’s very much a community oriented society, compared to the more individual focused society at home. Peace Corps told us that if we spend too much time alone in our rooms, our families may think that is weird and worry that we are sick or unhappy. Our families were also told that we like to have time to rest, but even so, after about 2 hours, my host family was knocking on my door to check on me! Sunday morning, I woke up for another cooking lesson, this one with my ma. This time I learned how to make bitterball soup with chicken (another soup that is more like a sauce or gravy served over rice). Bitter ball is a small eggplant-like vegetable found here in Liberia and other countries in West Africa. After we finished cooking, it was time for church. Visiting a Liberian church was definitely a new experience for me! The service was full of music from the choir (which my ma is a part of) and lots of singing and dancing. 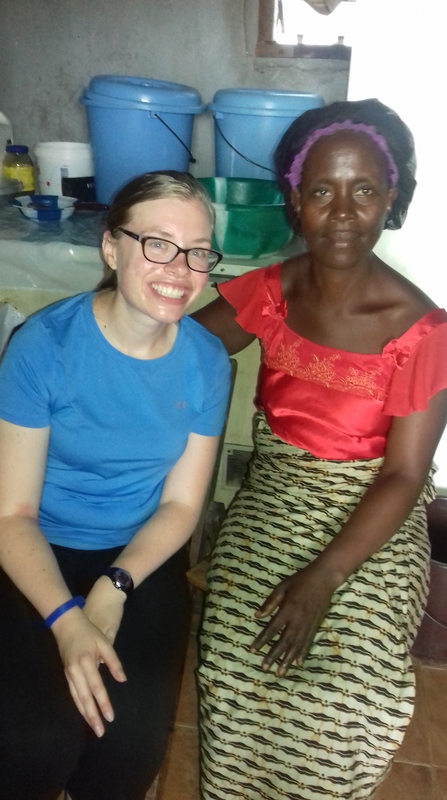 Because it was my first time at that church, during the announcements I had to stand up and introduce myself and share that I am from America and am with the Peace Corps. Luckily my ma gave me a heads up so I didn’t feel totally put on the spot! The entire service lasted a little over 2 hours, which was relatively short compared to some of the other churches my fellow trainees went to. After church, we headed home and wrapped up the weekend with some time to rest in the afternoon and more card games in the evening! 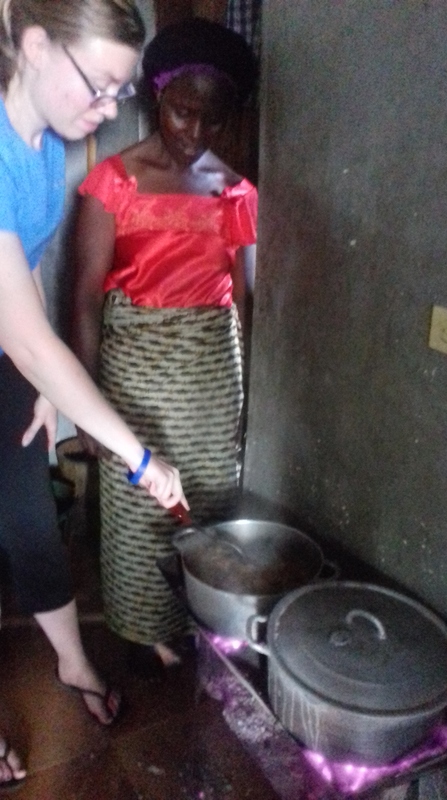 This entry was posted in Africa, Liberia, Peace Corps and tagged Africa, cooking, host family, Liberia, Peace Corps, Peace Corps Liberia. Bookmark the permalink.